Sept. 23. St. PIO OF PIETRELCINA (Padre Pio), Priest, Capuchin, Franciscan friar. His Sufferings. Video summary and St. John Paul II’s Homily During His Canonization (2002). St. Pio Pietrelcina (Padre Pio), Priest, Capuchin, Franciscan friar. His Sufferings and St. John Paul II’s Homily During His Canonization (2002). Today we celebrate the feast of St. Pio Pietrelcina or Padre Pio, as he is known worldwide. Padre Pio was a man who bore numerous sufferings and trials throughout his life with great patience, seeing in them a way to conform himself more with Our Lord Crucified. 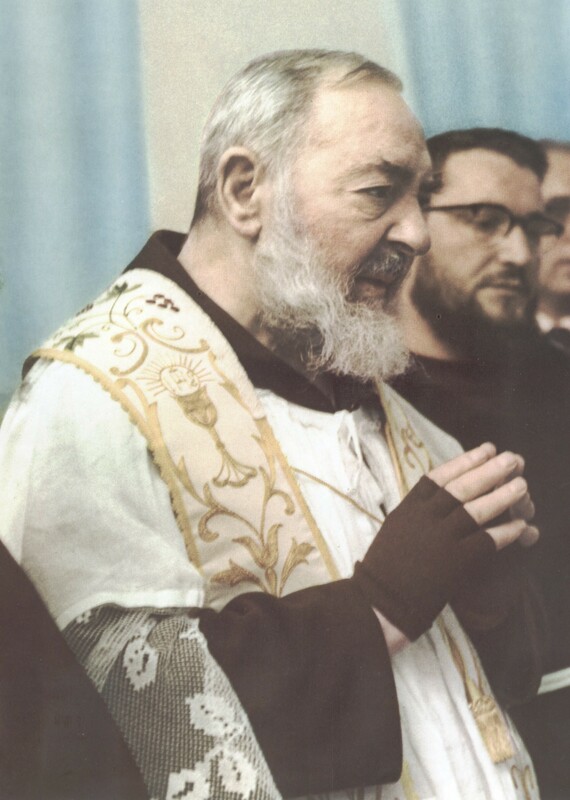 A man of constant prayer, “I am a poor Franciscan who prays”, he said, of charity and generosity in administering the Sacrament of Confession, Padre Pio saw Jesus in the sick and the suffering. During his life, a lot of people had recourse to the Italian Capuchin Franciscan monk to ask him prayers and intercede for them to God. The future Pope and Saint, John Paul II was among them who as the then Archbishop of Cracow (Poland), asked him to pray for a Polish lady, sick with throat cancer. In two weeks’ time, she had been cured of her illness. A lot of people have reported cures through the intercession of Padre Pio when he was still alive. As such, many wanted to have a souvenir from him and resorted to cutting his habit, as what happened with St. Francis. On September 20, 1918, while doing his thanksgiving after Mass, Padre Pio had a vision of Jesus. When the vision ended, he had the stigmata in his hands, feet and side. His life became more complicated after that. A lot of people among which are medical doctors, Church authorities and curiosity seekers came to see him. Aside from the pain and blood loss brought about by the stigmata, his other sufferings were: extremely high fever which broke the mercury thermometer leaving the doctors puzzled and the frequent night visits, insults, attacks and thrashing by the devil, angered by the many souls gained by Padre Pio for Christ. These physical batterings left him bruised, bloodied and sleepless on many occasions. He also suffered the calumnies received from ecclesiastical personalities and authorities. Nevertheless, Padre Pio maintained his serenity, abandoning his fate into God’s hands. On two occasions (1924 and 1931), the authenticity of the stigmata was put into question. He was prohibited from celebrating the Holy Mass publicly and from hearing confessions. In spite all these, Padre Pio maintained his calm, without complaining. Soon after, these prohibitions were lifted. -Fr. Rolly Arjonillo, priest of Opus Dei. CATHOLICS STRIVING FOR HOLINESS Facebook page and website. Hope you like our FB page and invite your friends as well to do so in order to help more people. “For my yoke is easy and my burden light” (Mt 11,30). Jesus’ words to his disciples, which we just heard, help us to understand the most important message of this solemn celebration. Indeed, in a certain sense, we can consider them as a magnificent summary of the whole life of Padre Pio of Pietrelcina, today proclaimed a saint. The evangelical image of the “yoke” recalls the many trials that the humble Capuchin of San Giovanni Rotondo had to face. Today we contemplate in him how gentle the “yoke” of Christ is, and how truly light is his burden when it is borne with faithful love. The life and mission of Padre Pio prove that difficulties and sorrows, if accepted out of love, are transformed into a privileged way of holiness, which opens onto the horizons of a greater good, known only to the Lord. “But may I never boast except in the cross of Our Lord Jesus Christ” (Gal 6,14). Is it not, precisely, the “glory of the Cross” that shines above all in Padre Pio? How timely is the spirituality of the Cross lived by the humble Capuchin of Pietrelcina. Our time needs to rediscover the value of the Cross in order to open the heart to hope. Throughout his life, he always sought greater conformity with the Crucified, since he was very conscious of having been called to collaborate in a special way in the work of redemption. His holiness cannot be understood without this constant reference to the Cross. In God’s plan, the Cross constitutes the true instrument of salvation for the whole of humanity and the way clearly offered by the Lord to those who wish to follow him (cf. Mk 16,24). The Holy Franciscan of the Gargano understood this well, when on the Feast of the Assumption in 1914, he wrote: “In order to succeed in reaching our ultimate end we must follow the divine Head, who does not wish to lead the chosen soul on any way other than the one he followed; by that, I say, of abnegation and the Cross” (Epistolario II, p. 155). “1 am the Lord who acts with mercy” (Jer 9,23). Padre Pio was a generous dispenser of’ divine mercy, making himself available to all by welcoming them, by spiritual direction and, especially, by the administration of the sacrament of Penance. I also had the privilege, during my young years, of benefitting from his availability for penitents. The ministry of the confessional, which is one of the distinctive traits of his apostolate, attracted great crowds of the faithful to the monastery of San Giovanni Rotondo. Even when that unusual confessor treated pilgrims with apparent severity, the latter, becoming conscious of the gravity of sins and sincerely repentant, almost always came back for the peaceful embrace of sacramental forgiveness. May his example encourage priests to carry out with joy and zeal this ministry which is so important today, as I wished to confirm this year in the Letter to Priests on the occasion of Holy Thursday. “You, Lord, are my only good”. This is what we sang in the responsorial psalm. Through these words, the new Saint invites us to place God above everything, to consider him our sole and highest good. In fact, the ultimate reason for the apostolic effectiveness of Padre Pio, the profound root of so much spiritual fruitfulness can be found in that intimate and constant union with God, attested to by his long hours spent in prayer and in the confessional. He loved to repeat, “I am a poor Franciscan who prays” convinced that “prayer is the best weapon we have, a key that opens the heart of God”. This fundamental characteristic of his spirituality continues in the “Prayer Groups” that he founded, which offer to the Church and to society the wonderful contribution of incessant and confident prayer. To prayer, Padre Pio joined an intense charitable activity, of which the “Home for the Relief of Suffering” is an extraordinary expression. Prayer and charity, this is the most concrete synthesis of Padre Pio’s teaching, which today is offered to everyone. “1 bless you, Father, Lord of heaven and earth, because … these things … youhave revealed to little ones” (Mt 11,25). How appropriate are these words of Jesus, when we think of them as applied to you, humble and beloved Padre Pio. Teach us, we ask you, humility of heart so we may be counted among the little ones of the Gospel, to whom the Father promised to reveal the mysteries of his Kingdom. Help us to pray without ceasing, certain that God knows what we need even before we ask him. Obtain for us the eyes of faith that will be able to recognize right away in the poor and suffering the face of Jesus. Sustain us in the hour of the combat and of the trial and, if we fall, make us experience the joy of the sacrament of forgiveness. Grant us your tender devotion to Mary, the Mother of Jesus and our Mother. Accompany us on our earthly pilgrimage toward the blessed homeland, where we hope to arrive in order to contemplate forever the glory of the Father, the Son and the Holy Spirit. Amen. Sept. 23: HAPPY FEAST DAY OF ST. PIO PIETRELCINA! 216 Spiritual quotes from Padre Pio for your meditation.